On the unknown planet Interk sits the dense and mysterious Moon Glow Wood. The planet mirrors Earth in all aspects of life and landscape. Two owls learn to read in the forgotten library of a dilapidated mansion which sits on the edge of The Wood. Smilecramp, the young owl, uses his newfound knowledge to form a plan that could present a life of peace and harmony to all the diverse woodland creatures. But to implement his plan to the predators of The Wood, who live by the dreaded food chain for survival, he calls for a self-imposed amnesty on preying. A group of courageous like-minded creature friends of the young owl, who are mystifyingly identified by unique silver adornments, join forces to promote the plan. Yuno, the old spider who has a silver dot on his forehead, is derided for creating his artistic webs which are purely for visual pleasure. “What a waste of valuable, capturing thread,” scorn preying creatures. A frustrated mole named Sleames, bearing a silver circle around his right eye, has always nurtured a private aspiration to build things “and not simply scrape tunnels with my claws,” Sleames sighs. “Then, I will build you a school,” Sleames declares with excitement in his voice. “I could create a hospital to cure sick and lame creatures who now become victims of the predators,” says Netta, the bee, who sports an attractive silver waistband. She is famous in The Wood for saving the life of a raven by administering her honey lotions and potions. “They say that preying is nature's way. Well, now there can be another way,” urges Smilecramp to Spitlan, the mighty vulture, who, with his fellow vultures, cast a brooding menace over The Wood. 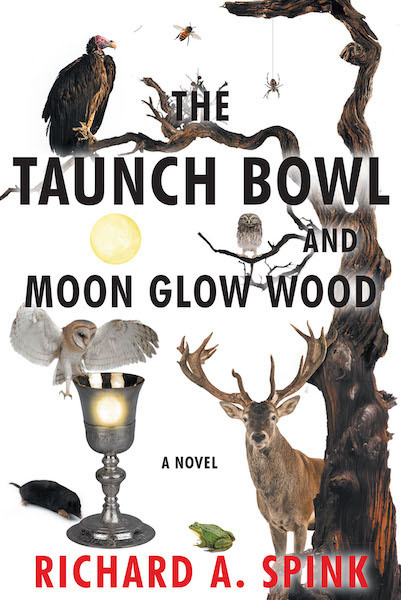 Meanwhile, hidden under the ground of Moon Glow Wood, unknown to any humind or any creature, lies the Taunch Bowl with its very own intriguing magical powers. What follows is a unique and gripping tale of intelligence, tenderness, and humor amongst the endearing and far-reaching creatures who enter into a romantic quest in the search for the improbable—the pursuit of a harmonious society.